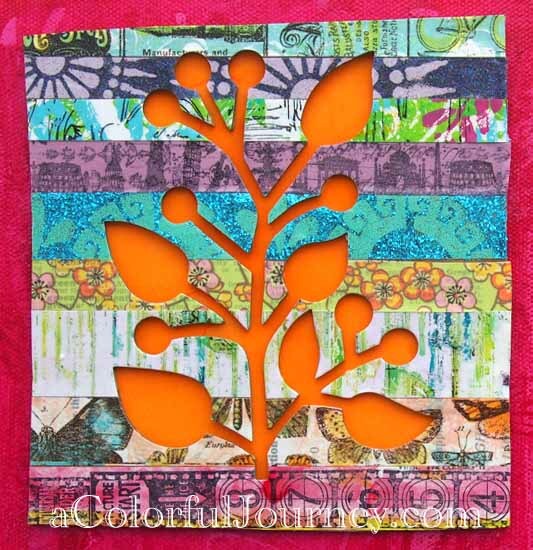 Previous post: September’s Colorful Gelli Print Party! I had, notice I said had, a whole drawer full of washi tapes that I hadn’t been using. I loved them when I bought them but they just sat in the drawer. Until I started transforming them with color and pattern. Suddenly they started being used. That is the seed that led to my latest workshop, Transform Your Tape! Not only washi tape, but also packing tape, and artist tape will be transformed! It’s on sale until class begins- just $30 for over 2 hours of video! You can find all the Transform Your Tape details here! And I am giving away a spot in this workshop! Just leave a comment below to enter! Want another chance to win? Share it and then come back and tell me you shared it and you’ll have another chance to win! Leave a comment here by Sunday, Sept. 15th to be entered in the giveaway! And the workshop starts on Monday, Sept. 16th! 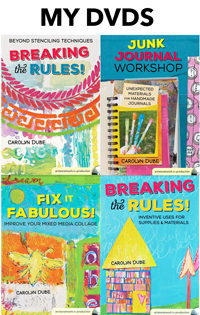 Update: Congratulations to Carol Samsel for winning a spot in the workshop! But what about all of you who have already registered for the workshop? You can play too! If you have already bought the workshop (so you don’t miss the discount) and you’re chosen by random.org then I’ll refund you the cost of the workshop! Here’s a video of the canvas I made today. You can also watch Washi tape and a Canvas on YouTube here. Now that I have bright, fun and playful tapes I am ready to use them! I started with a piece of cardboard covered in all sorts of tapes which were made using the techniques in Transform Your Tape. Thanks to my die cutting machine, these shapes were easy to make! Both dies are from Sizzix (branch with leaves and arch frame). The canvas wasvcovered in paint and ink. 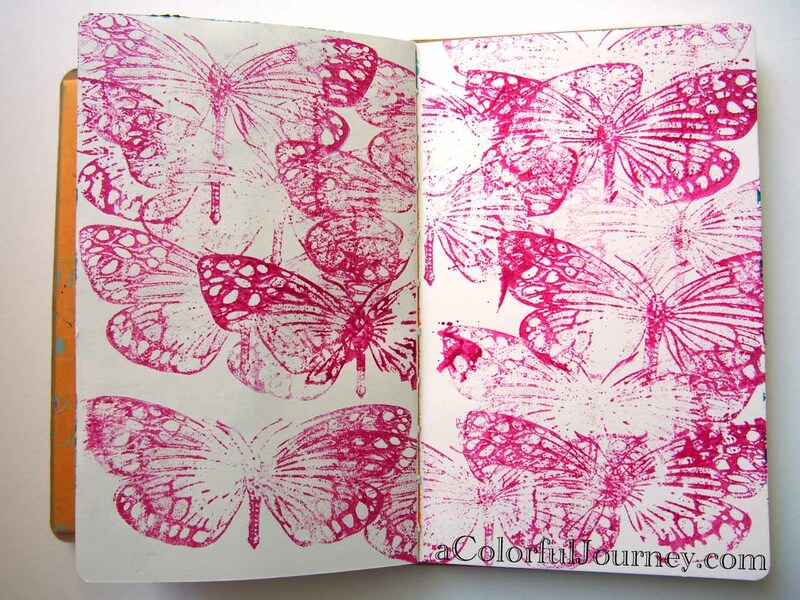 The paint on this art journal page came from stamping off a butterfly rubber stamp as I used it to create a subtle effect on the canvas. I know, me subtle! The lines of color on the chipboard letters? That’s Inka Gold by Viva Decor with the Mini Lines Stencil by Mary Beth Shaw over at StencilGirl Products! I love the look of the metallic with such fine lines! 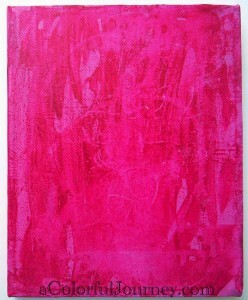 Here’s the final canvas! It might not be sunny outside today but I have a bright rainbow of color here! Hope your day is full of color too! Linking up to Creative Every Day, Art Journal Every Day, and Paint Party Friday! Awesome project. Love the results and that you have jump starts for several other projects in the process! The workshop looks fantastic! I absolutely am crazed by your You Tube videos. Super excited to take this class, even if I don’t win. I really love all those tapes and the whole project!! I just love your zest for colorful journaling. You are infectious. I can’t wait to see what next you do. So very interested in your transform your tape workshop!!!! Lovely project. Always love your videos and art. Would love to win a spot in the class. Would love to win. Enjoy your videos and tips. NOW that is awesome. I have tons of washi tape and this is a fun way to use it. Just enough orange added at the end. Thanks for the chance to win a workshop spot. Awesome video! I LOVE pink and orange together. One of my favorite combos! I put this on my facebook page, too! I’m beginning to feel like I’ve been left behind- I have no tape, no tape to transform – but I really wish I did, because you work such magic with it!! I always love what you do and find such inspiration here – thanks Carolyn! I’d love a chance to win a spot in your class. Looks exciting and I have plenty washi. No die cutter but can figure something else out. Thanks! You don’t need a die cutter at all! In the workshop I show all the techniques for altering and transforming the tapes- what I am showing on the blog are some of the ways I use the tapes because now I am actually using them instead of just collecting them LOL. You could just as easily cut with a scissors as use a die cut machine. NOW! is the time! 🙂 You are flying…..
What a great idea for a class. I’d love to win a spot. Love the idea of this class! Winner or not, I am going to sign up as soon as I move into another billing month on the credit card! LOL! Every time you post, you outdo your last one. Now that I’m working full-time, I don’t get here as much as I’d like, but would I love to win a ticket to your workshop. Se you around the FB. Thanks for *everything* you do. I have and they are absolutely fabulous! So playful and fun! And they have the most wonderful adhesive! I really love this idea. I tried making tapes but mine turned out awful. I would love to see what you will do with tape. I need more inspiration and you are the person to give it. I’ve a pile of washi tape, which I simply had to have, of course haven’t used… sounds like a good plan to transform. Love your videos. All ideas on how to use washi tape is fun to learn about. I use mine quite a lot, specially in notebooks that needs a bit of colour! Beautiful tape!! Thanks for the opportunity to win a spot in your class…so fun! Love your rainbow canvas too! Great final page and thanks for the tutorial. Love what you did with the tape. Gonna try that myself soon. This looks like a fun class. I always enjoy watching your videos and seeing you work. I would love to win one of your classes. I enjoyed your video and like how you transformed the tape. Thank you for the inspiration! Thank you for the chance to win a spot in one of your classes! Great project! I also have tons of washi tape that I just love, but somehow rarely find a way to use in my projects or art journal layouts. This post has already given me some good ideas, and I would love to learn more via your workshop. Thanks for the opportunity to win! What a unique and creative online workshop idea! Oh wow! I feel instantly inspired to run and buy some fancy tapes!! I am dying to see this workshop …if only I could be the winner. Here is hoping. Love your work and love washi tape, a great combination . Thanks for a chance to win this class! This workshop looks amazing. Thank you for an opportunity to win the chance to see you create these gorgeous tapes! what fun. i’d love to win a spot. thank you! I would LOVE a spot in your workshop! Love all the fun tapes; I’ve turned onto a collector and now I want to use them! oh wow!!! what a cool project!! lovely work….Have a wonderful weekend!!! You are not only flying.. you are SOARING!!!!!!!!!!!!!!!! LOVE LOVE LOVE this. Oh wow – what a great idea! TFS and the opportunity to win one of your classes! p.s. i don’t own one roll of washi tape. Just sayin. 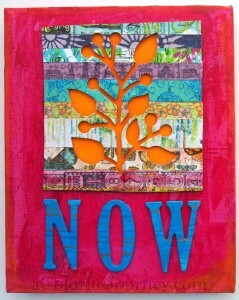 Everything I do with my Gelli Plate I’ve learned from you. From the beginning, I taken each step with you on your videos and your blog. Thanks for everything! What a cool idea,am going to try it out this weekend. Would love to win a spot in your class, love your colors and your art makes me happy. I love the way adding colours makes so much difference to the washi tape. Will definitely have a go at making paper with the tape and then cutting out a stencil shape. I love the effect. Thanks for sharing your projects. Love the way you present your creative ideas. You have so many great creations and a wondrous way with color. I’m always hoping some of your inspiration transfers over to me. I’ve made lots of gel plate papers, but most of them are in a file drawer of stacked on my desk. Just can’t seem to add more color or designs to them, or cut them apart and use them on something else. I keep hoping for the right moment to use them. I know if I wait too long, they will be tossed by my descendants in the recycle bin, so better get busy. I received some medical tape recently and will try to make Washi tape out of it. I did a similar thing by cutting up old greeting cards and using them on new cards, but didn’t try die cutting them. Will try that soon. Thanks for the great ideas. Always good to learn a new way to use things we already have. Looks interesting and fun! I love. love, love washi tape but tend to use the same ones over and over again. I would love to win a spot in your class so I can start using those unloved tapes in my stash. Would love to learn how to use washi tape!! Love to learn anything from you! I,shared! I love your canvas and I’d love to win a spot in your class!! Thanks for the chance!! 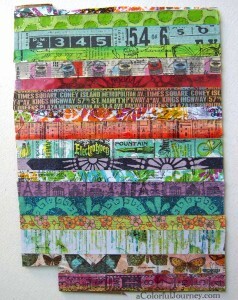 Love the look of the personalized washi tape–would love to learn your process–looks like lots of fun!! Love all of the bright colors 🙂 It would be so cool to win …. 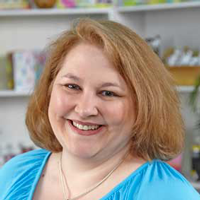 Your washi tape workshop sounds awesome!! I am so sharing your site! This looks like so much fun! I would love to win! I really enjoy all your videos! Way cool, would love a seat in your class. Terrific tape! Always enjoy your style, Carolyn!! Thanks for the chance at the class! I adore your fun and frolic with art! 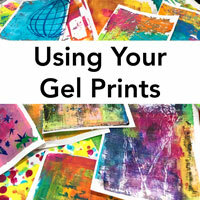 The Gelli prints you do are fab and I am inspired by you. Many Thanks!!!! This is so cool! I think the color combo is very bright and fun 🙂 it’s great how your die cut machine will cut the cardboard into such a delicate tree shape! No you have many more peices to use in the future. This looks like a lot of fun! What a great project! I would love a spot in your class! Thank you for the opportunity! This sounds like a great workshop. I too have a draw full of washi tape that I love but never use for some reason. It would be awesome to win. Your videos always get me inspired to sit at my art table and play. I am always looking forward to seeing what you are going to do in your next video! Thank you for offering a free spot in your washi tape class. Can’t wait to take this class. oh, you’re funny…..i can relate! wow, I’m so excited to find your blog!!!!! you have alot of great inspiration here!!!!! Looks awesome. I have a ton of packing tape left over from moving. I’d love to upcycle at least some of it! Hello! I loved the video! Thanks so much! I’ve been collecting and using washi tape in my art quite a bit since I was introduced to it. I’ve even stamped on it, colored it, but I would love learning new ways of creating with it. Your videos always seem to set my muse into action, I am looking forward to the class. And I am gonna share on FB, twitter, and P. Good wishes come in bright colors! Fabulous! Love how you’re using things in your stash, especially with all those tapes. I had to laugh at your comment about “maybe 2 months” – I didn’t think that was bad at all as I’ve been finding things around here I meant to use “maybe 2 years” ago. I have so much unused washi tape it would be fun to take a class to use some of it up. Love your project! And I love how all of the pieces/scraps from your die cutting are usable! I would love to take your workshop! Thanks for the chance to win! Thanks for the opportunity to win a place in your workshop. You are very inspiring. Just looking at your project makes me happy! Love the colors. 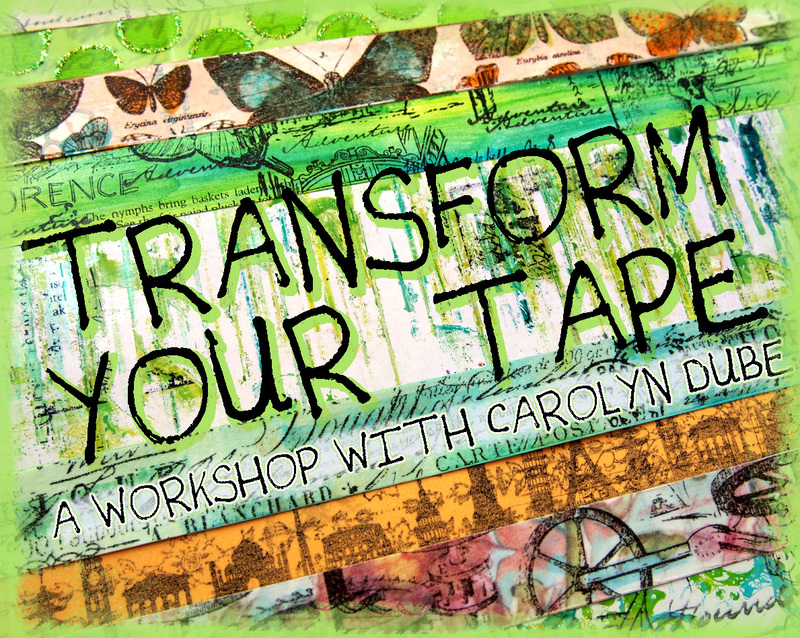 Thanks for a chance to win a spot in the Transforming Tape workshop! Those tapes are really cool! Thanks for the chance to win. I have a lot of washi tape sitting in the drawer too. I love your idea of layering it and then die cutting it. Great tutorial once again. Thanks. Love the canvas, Carolyn. My favorite colors are brights – and pink/orange is so awesome together. Thanks for sharing your journey! You,my friend,are the reason I don’t give up on being an artist! I love your style AND your love of color. A girl after my own heart! I really enjoyed your video!! I love the bit of orange too. I’ve shared your post on my wall. Although I have never owned any washi tape, I am certainly interested in learning how to transform packing tape and masking tape, which I DO have. Thanks for allowing me the opportunity to win a spot in your new class. What a very, very cool canvas you made!! 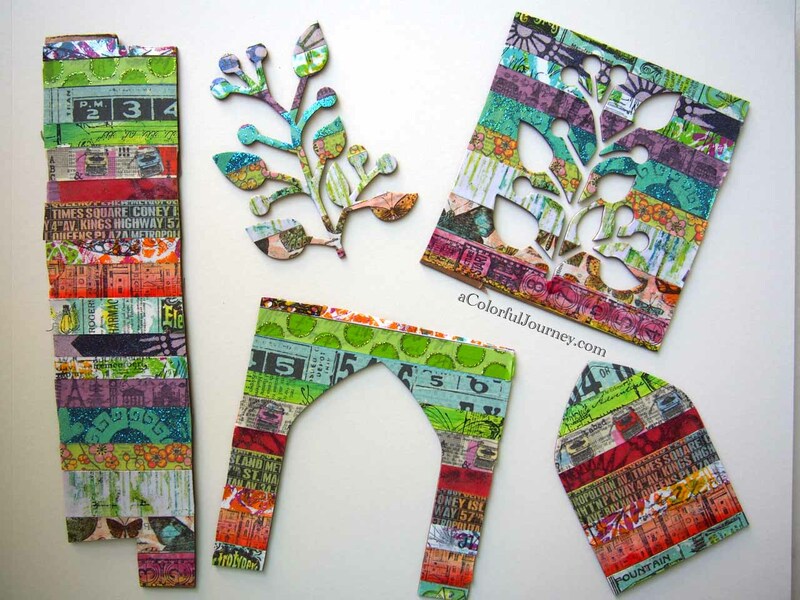 I absolutely love the tapes you made and striping them across that cardboard and then cutting out shapes…WOW!! You are a creative genius! I am creatively blocked right now but I am going to keep watching your awesome videos…they make me feel there is light at the end of this tunnel I am in. Wish I could afford to take your class but things are tight right now. Maybe I’ll win that spot!! Thanks for offering a chance to win and thanks for sharing your art! Great job on the canvas! I’d love to take this class – I have a drawer full of washi and I’d like to use more of it – and learn how to make my own. Thank you for the chance to win. Love this project and cannot wait to try something similar – thank you! And I would love to win a spot in your class so I really appreciate the chance! First to facebook to share, then to my washi stash! Shared on facebook on my personal page! Ohhhhh how I wish I had $30 laying around, but I don’t : ( So I’m crossing my fingers and wishing for a win. I wonder if we share in multiple ways if we’ll get multiple chances to win?? Heeehee : ) A girl can hope, right? I love, love, your style of art. Your use of color is fantastic. Your ideas are so creative. Oh how I would love to win a spot in the workshop. I keep trying to win some freebies from you generous teachers. Maybe this time. I signed up just in case I don’t win so I can be sure to get in the class. Love your creativity. Wonderful colors! 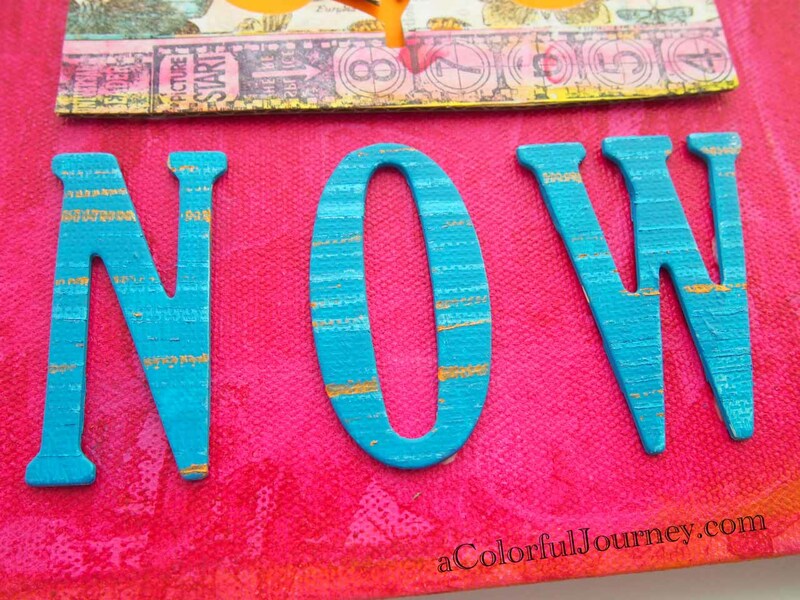 “Now” is “wow”! Love the canvas! Great idea about the washi tape coloring! That would be a very interesting class. Thanks for a chance! What a cool canvas! yes, I’d love to win a spot in your workshop. I really enjoyed the video too. Those are beautiful tapes. Way prettier than the store bought. Love your videos and always learn something. Thanks for taking the time to do them, and thanks for offering a spot in the upcoming class. Fingers crossed! 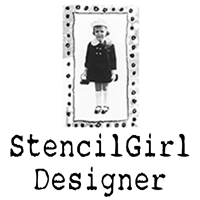 I just discovered you and your beautiful work through a Stencil Girl newsletter that I recently subscribed to. 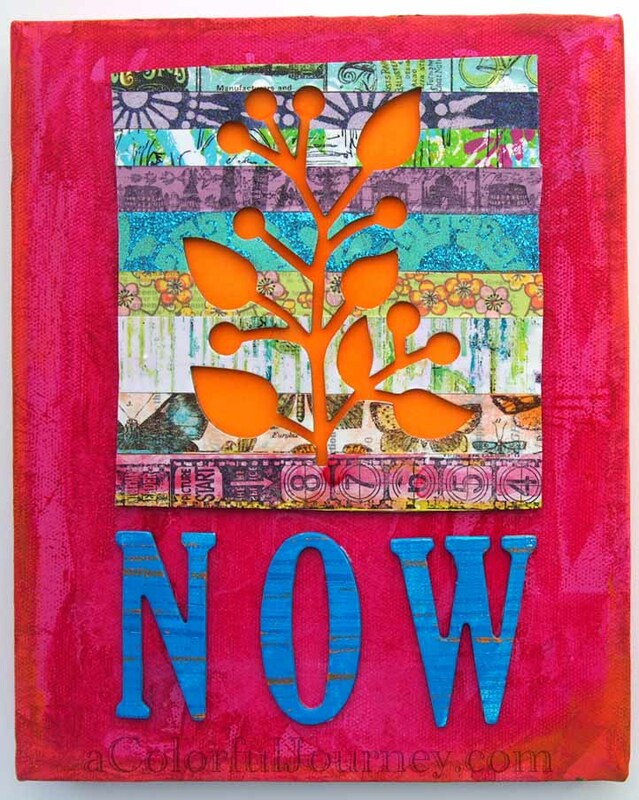 Love your video using washi tape and die cuts, and the way you used those pieces to create your canvas. I never would have thought of that. I love the bright colors too, and find that I tend to gravitate toward those myself! Can’t wait to see more of your work and have subscribed to your blog and your You Tube channel. I’m lovin’ it! 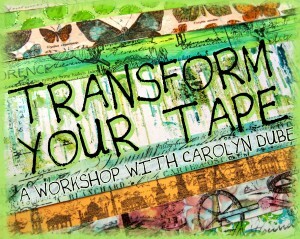 Thanks for the chance to win a spot in your “Transform Your Tape” workshop. I would love to be able to make my own beautiful tapes. I would love to take a class with you, especially a free class! Thanks for the chance! INCREDIBLE & AMAZING opportunity ….I’d be GRATEFUL*GRATEFUL*GRATEFUL to be the winner ! this is going to knock some body’s socks off =}. I LOVE WASHI TAPES, but, the price in the stores are cost prohibitive to many. BLESSINGS ! !! ! Totally love this project! I’ve been playing with tape and paint all week and would love to win a spot in your awesome workshop – Transform Your Tape! Carolyn, This is so cool! and of course I’d LOVE LOVE LOVE to win a spot in this class!!! I love Washi tape. I have tons of it. Do I use it. Not so much. I need your class. Signed up and gathering supplies. Can’t wait. Love your work, love your teaching, love your inspirational motivation. Would love to be chosen for a spot in your washi tape class. What a great idea for a workshop! I love your negative die cut…..that would look awesome on a card.. I would never have thought to use Washi tapes like this with card board. I am on a craft spending “budget”, lo or I would have signed up for this workshop. Because I’ve taken your free Use your Words wksp and loved it. Your style of teaching is great, easy to follow and you really cover any questions that may pop up. Thanks for a chance to win. And again, awesome art journal page. I would love to win a spot in the transform your tape class. Just discovered your website; love your art! Winning the “transform your tape” class would certainly be an early Christmas Present. 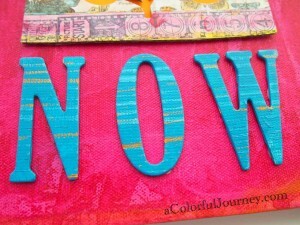 I am a total newbie to art journals and the gelli plate. I drove all the way to Blick’s in Pasadena from Banning CA to get mine and am in love with just the fun of it. Not much “art” yet but love, love, love the thing. And I am so glad I found you, Carolyn. You are a continual source of fun and inspiration! Carolyn…thanks for all your great ideas. You are incredibly creative and talented. I loved your gelli print workshop and made some really fun pages. Your inspiration and enthusiasm always make me anxious to keep at it and make more art. Thank you for that! I would like to take your washi tape workshop but am recently unemployed and the budget is tight. No worries though. I’m just really thankful that I have a pretty well stocked studio and will continue to follow your blog to pick up all your great tips and tricks. What’s not to love when it comes to washi tape. But would never think to die cut a sheet of them. Thanks for the idea! Love what you did with the tape sheet and want to learn how. 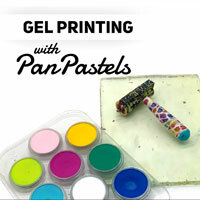 I really like your style and am currently am enjoying the gelli plate video workshop. Might as well, although I am RUBBISH at following thru on online classes 🙂 This one, I just might see thru as I too have a drawer of Washi tape I’m not using to it’s fullest. Oh How I would love to win a spot in your class!! Your use of the tape is sooo cool! I’ve watched some of your videos about this class & how you’ve used bits & bobs from it & I am very intrigued! Might have to sign up for this one if I don’t win it first! HA! Thanks! Love all those bright colours. My tape is underused. Would love to join you in this class. Here’s hoping……. Very cool project!….Love the colors! 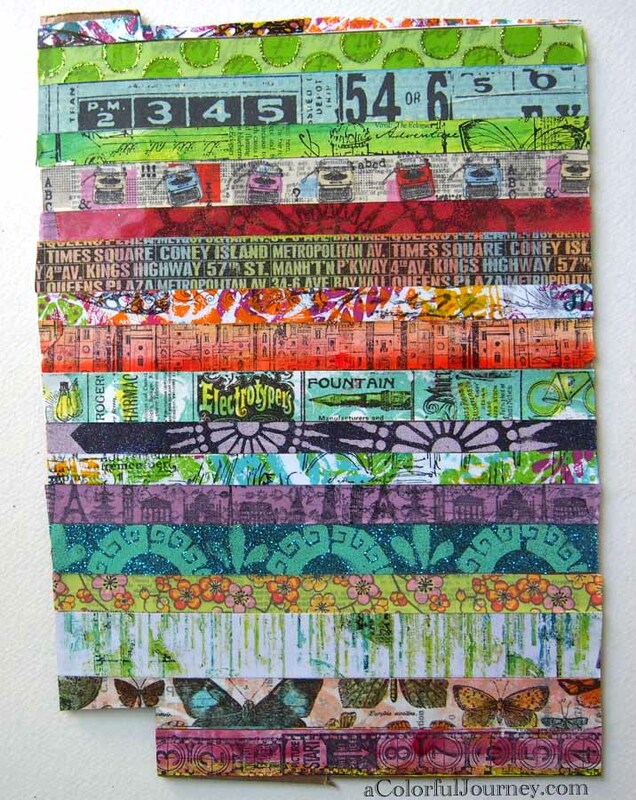 More ideas for ways to use my washi tape….Yay!! Great idea Carolyn! I love your fabulous creativity! Thanks for the giveaway! I’d love to take your class! what a wonderful sounding class. count me in. I love washi tape and would love to learn even more ways to use it. Thanks. I am addicted to your videos. Would love to win. awesome project and great giveaway! Yep, I surely need this class, LOVE wahsi tapes!!!! The idea of making your own ‘washi’ tape is fabulous! Genius! I love watching your videos. You are so much fun and create fabulous art! Thanks for the opportunity to win a spot! Gorgeous canvas!!!! Love the colors you used- vibrant-happy 🙂 Inspired to try making a quilt like array with tape. I’ll probably have to start with packing or duct tape until I can get some of the other. I would love to win a spot in this class! I can’t drive at night any more-so I miss going to art classes. To be able to do this one right here in my art room-awesome!! I appreciate the possibility of winning!! New tricks with supplies that are sitting on the shelf are always good. WOW, you must be popular, almost 200 comments. I’m a first time visitor, but I’ll be back. Washi is something I don’t have in my studio, but now I need an entire drawer full. Hoping for a win to take the workshop. Your videos are awesome. 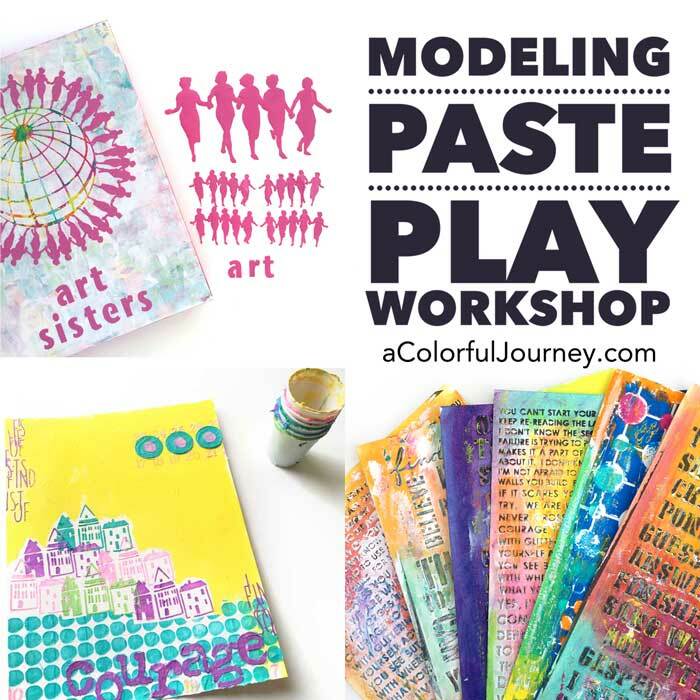 I would love to do this workshop with you… looks like so much fun! Would soooo LOVE to WIN!! I love all your tutorials!! I spent all my money this month of stencils and acryllics for gelli plate and some washi tape!! Now if you could just help me by continuing to help me learn to use my supplies.. I won’t feel bad about my new addictions! LOL Love the video! LOVE YOU and your spirit! Thank you!! I love your blog and enthusiasm. 6 months ago I had never heard of washi tape. Now I am begging to be in your transforming tape class so I can have even more tape to inspire me. 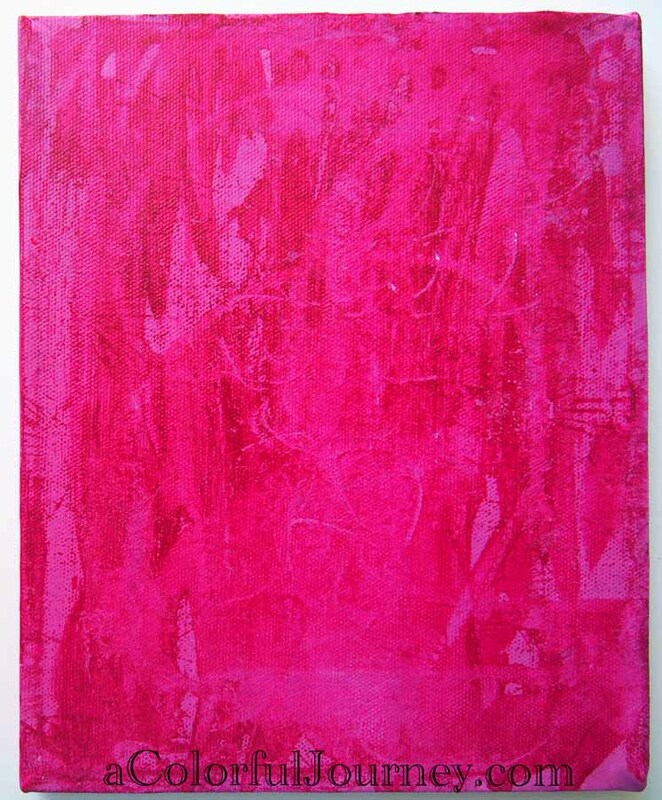 PS My sister took one of your gelli printing classes and said it was one of the best times she had ever had. I like to have a good time too!!! Oh my gosh, I would love to win to win a spot in your Transform Your Tape class. What fun that would be. I enjoyed your video and the finished canvas. Thanks for the inspiration! Crossing my fingers. I’ve just recently discovered washi tape. Your usage has provided inspiration for me. I can see a place for some in a book I’m altering! Thank you! thanks for giving us the chance to win a workshop. It is appreciated. Sounds Awesome! Thanks for the chance!! Wow! Love some of your different ideas for using those tapes!! This looks like a great workshop!! Absolute wonderful and inspiring video tutorial! I am beginning to have a collection of these tapes as well….this could be just what I need to get going and DO something with them!